Claudia B. Bowers, 95, a resident of McLeansboro, Illinois, passed away Monday, March 18, 2019 at the McLeansboro Rehabilitation and Health Care Center. She was born April 17 1923 in Walpole, IL, the daughter of Oscar and Amy (Burnett) Bridwell. She married John Louis “Briss” Bowers on May 13, 1944 and he preceded her in death. Claudia worked as an artillery shell builder during World War ll in Dixon, IL and was also a member of the New Life Assembly of God Church in McLeansboro. 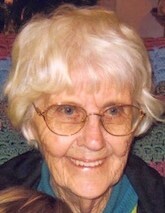 Claudia is survived by three sons: Johnny R. (Phyllis) Bowers of McLeansboro, Larry Joe (Phyllis) Bowers of Orient, IL and Mark “Bub” (Judy) Bowers of McLeansboro; one daughter, Andrea June (Melvin) Tennyson of McLeansboro; eight grandchildren, eighteen great grandchildren and ten great-great grandchildren. Several nieces, nephews and cousins also survive. She was preceded in death by her parents, husband, one infant brother, Owen Bridwell; one brother, Lawrence Bridwell; and three sisters: Vacal Johnson, Carrie Foster and Maud Rhoads. Funeral services will be held Thursday, March 21, 2019 at 1:00 p.m. at the Gholson Funeral Home in McLeansboro with Rev. Andy May officiating. Visitation will be Thursday, March 21 from 11:00 a.m. until the time of service at 1 p.m. at the Gholson Funeral Home in McLeansboro. Claudia will be laid to rest at the IOOF Cemetery in McLeansboro.